A ferry in Penobscot Bay carries vehicles and passengers from Islesboro to Lincolnville. ISLESBORO, Maine ― In April 2018, residents of Islesboro saw the cost of a roundtrip ferry ticket to the mainland more the double. Since the price hike, islanders say the financial burden has threatened the long-term sustainability of their island community. As Maine Department of Transportation officials again review Maine State Ferry Service rates through a renewed rulemaking process, Islesboro residents are urging them to consider seasonal rates and ways to cut costs instead of just increasing ticket prices. On Saturday, Transportation Commissioner Bruce Van Note visited Islesboro for a community meeting to address the rate-setting process and to hear comments and concerns from residents. About 100 people filed into Islesboro Central School gymnasium, not to protest the current rates but to present anecdotes about why the rates aren’t working for the island and what should instead be considered. 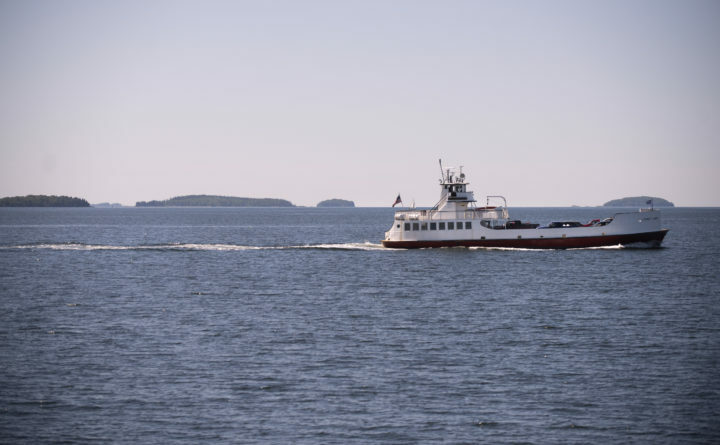 The Maine State Ferry Service provides transportation from the mainland to Vinalhaven, North Haven, Islesboro, Swans Island, Frenchboro and Matinicus. Last year, the Department of Transportation implemented a new ferry rate structure. Instead of having a different rate for each island, a flat rate structure was implemented. For Islesboro residents, ticket prices more than doubled. In a lawsuit filed last summer, Islesboro residents allege that transportation officials failed to follow the proper process to implement the new rate structure. In response to the lawsuit, state transportation officials restarted the rate-setting process. Earlier this month, transportation officials released another flat rate structure proposal to keep the rulemaking process going. However, Van Note said he wished he didn’t have to send out that proposal and said he would be “shocked” if it was the final proposal. Van Note, who took over as commissioner in January, said Saturday that he wants to take a “fresh look” at the ferry service rate structure, and will be meeting with each island community served by the ferry service. He said a final proposal will likely be put forth in September, but another proposal for consideration could be put forth next month. To avoid a budget shortfall caused by declining ridership and increasing operating costs, transportation officials have said revenue has to increase by 17 percent. But Islesboro residents on Saturday balked at Van Note’s assertion that ridership is down because of the “Amazon effect” ― meaning more people are shopping online instead of going to the mainland. “The reason ridership is down is because people can’t afford the ferry,” Islesboro Selectboard Chairman Archibald Gillies said. Pendleton proposed that the department implement seasonal rates that would be higher during the summer tourist season, then decrease to a lower rate for nine months each year. Van Note said his staff is considering seasonal rates, commuter rates, different rates for individual islands and re-evaluating the rates for commercial vehicles. Owen Howell, the physician’s assistant at the island’s medical center, warned Van Note that the increased ferry rates are preventing people from going off island for necessary medical care. He suggested that transportation officials expand the guidelines that dictate who can receive complimentary travel for medical trips, which the ferry service currently only provides in life-threatening cases. Several people at the meeting also chastised the department for not being creative enough in efforts to cut costs, especially as it relates to the fleet of vessels that service each island. “I’m very disappointed in some of the lack of creative thinking,” Earl McKenzie said. It was suggested that the ferry service consider electric ferries, especially for the three-mile Isllesboro route, as well as only building vessels that do not require additional staff. While Saturday’s meeting was considered “informal” for the rulemaking process, Van Note said the feedback he gets at each island meeting will be taken into consideration. A formal public hearing will be held in Belfast on April 24. Correction: An earlier version of this report incorrectly spelled Owen Howell’s name.